The team members at The Scoreboard Man are Paul Leskew, Marlene Leskew and Heather Bourne. Combined we have more than 80 years experience in the scoreboard business. We work hard to get to know our customers, their needs and to find the perfect scoreboard and scoreboard accessories for their facility. Proudly Canadian, serving Ontario, Newfoundland, Northwest Territories and the Yukon, The Scoreboard Man has been in the scoreboard and display business for over 40 years. The Scoreboard Man offers complete turn-key packages, including consulting services, for the supply and installations of electronic scoreboards for all sporting events, video systems, electronic message centres, scoring tables and advertising panels. We also offer custom metal mesh protective cages, custom corner mounting systems, installations and on-site service for all of our products. The Scoreboard Man’s very own protective cages are designed to wrap-around protecting your scoreboard from all angles and sides. Nevco, Inc., is the largest private manufacturer and provider of video display and scoring solutions. For over 75 years, Nevco has provided colleges, universities, high schools, park and recreation groups and other organizations with some of the most innovative scoring and LED video display products in the industry. Nevco is known for its specialty in designing custom facility solutions, quality of products and superior long term financial value. Today, Nevco scoreboards, message centers and video displays are used to enhance the fan experience at events in more than 100,000 locations around the world. For more information on Nevco, visit their website at nevoc.com. In Orillia Ontario, in 1971 Paul Leskew founded Challenger Athletic Products Inc. with two partners. Challenger, in a very short period of time, became Canada’s premier scoreboard manufacturer in Orillia, ON. 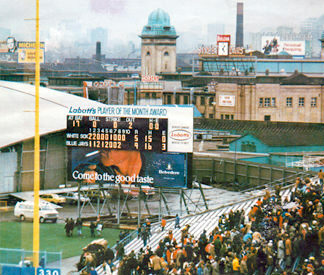 One of Challenger’s milestones was building and installing the Toronto Blue Jays first electronic scoreboard for their inaugural season in 1977. Over the years, Challenger’s markets spread world- wide with installations in Australia, Scotland, Ireland, US, and Europe. In the early 80’s, Paul Leskew bought his partners out and became the sole owner of Challenger Athletic Products. 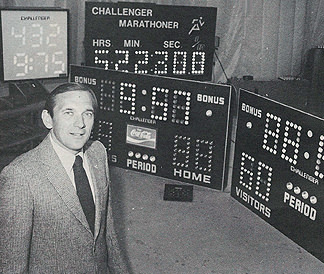 In 1985, Challenger merged with Nevco Scoreboard in Greenville, Illinois. Nevco set up its Canadian operation in Orillia, Ontario. Paul Leskew became known as The Scoreboard Man transitioning from manufacturing and sales to strictly sales. The Scoreboard Man focused on developing Nevco’s markets in Ontario, Newfoundland, the Yukon and the Territories.